Katzeek began with familiar names such as Dzantik’i Héeni and T’aaḵú, both of which point toward the resources that were abundant in those areas. Katzeek translated Dzantik’i Héeni as “precious water for the starry flounder.” Starry flounders weighing between 5 and 20 pounds were once abundant in Gold Creek, Katzeek said, noting that the name refers not only to the creek but to the whole area. The name T’aaḵu refers to an abundance of geese. 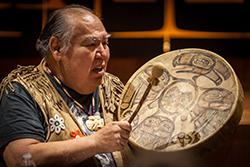 Other traditional names point up the interrelationships between the people and the land, such as Yadaa.at Kalé (Mount Juneau) and Aanchgaltsóow (Auke Rec). Yadaa.at Kalé means “the beautiful face of the mountain.” Katzeek said hunters returning home after a long and dangerous journey would see the face of the mountain and feel happy because they were home. The name Aanchgaltsóow has to do with logistics, Katzeek said, and refers to the fact that the area now referred to as Auke Bay Recreation Area was once used by people from all over Southeast – Haines, Kake and Sitka and elsewhere. “It was a nexus, a key geographic area,” he said. Katzeek also shared several traditional stories with the students that relate to place names and their geographic characteristics. In one story, two giants (mountains) in the Taku area that have long stood side by side peacefully get angry with each other and fight, and one giant, Lkoodaséits’k, is defeated. Parts of Lkoodaséits’k are spread across the area, resulting in place names such as Lkoodaséits’k Leikachóox̱’u (Lkoodaséits’k’s windpipe) and Lkoodaséits’k Shaayi (Lkoodaséits’k’s head). Katzeek said in addition to showing geographic characteristics (the giant’s head is a small mountain that resembles a head), this story is also important in teaching the crucial role of words and respect. Fights can spring up quickly. “Watch how you talk to each other,” he told the students. In another major story that Katzeek said originated in this area, a sea monster, Gunakadeit, brings abundant food to a hungry village – salmon, halibut, seals, many kinds of water fowl, and much more. 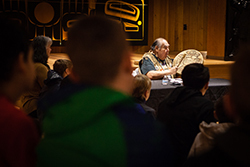 Throughout his presentation, Katzeek asked the students to say the Tlingit place names out loud and explained that the crucial concept of respect is embedded in the language. Language is one element of the Voices on the Land program, a three year program funded by a federal grant. 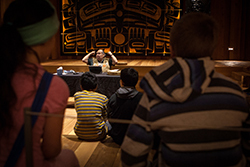 The main goals of the program are to improve literacy skills and familiarity with the Tlingit language through performing arts and digital storytelling. Participating schools include Gastineau Elementary, Harborview Elementary, Dzantik'i Heeni Middle School, Floyd Dryden Middle School, Riverbend Elementary and Glacier Valley Elementary.